Of all the 2018 education issues, Teacher Pay has to be one of the hottest of the year. We experienced this first-hand in Arizona where we just got accepted as a route to teacher licensure and the protests started. 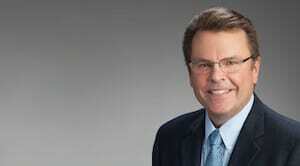 However, the fallout was pretty great for a new program. We had tons of calls in the first month from people who wanted to know if the Arizona teacher pay raise of 20% was real! We now have 25 Arizona Teachers of Tomorrow teachers working in schools and many more applicants working their way through the program. In fact, the protests shifted public support for increased teacher pay this year. Education Next does an annual survey on public support for different education issues. 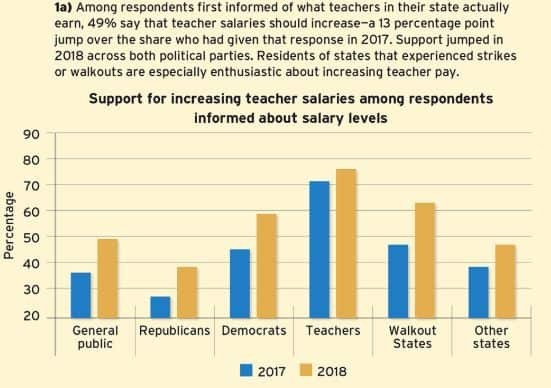 Among those provided with teacher salary information, 49% said that teacher salaries should increase – a 13% point jump over the previous years and the largest percentage in the history of the survey. With West Virginia, Oklahoma and Arizona all having successful actions last year, it seems like more teachers are looking to become activists for getting higher pay and higher budgets for classrooms. Already, Washington State has walkouts and people say it is only a matter of time before LA teachers walk. Here in Texas, our Governor is advocating higher salaries for teachers who perform well and there is going to be a big push to find ways to pay teachers more who really get things done for students. This is still a very hot button issue. In the same public opinion poll, 48% support merit pay while 36% oppose. There is much higher support among Republicans (55%), so it may be something that Governor Abbott can get done. 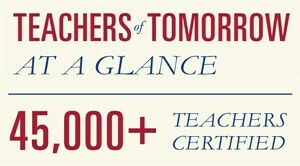 Teacher pay is changing, and, with it, attitudes on what our teachers deserve to earn. There is a rising tide of respect for teachers, and – if Arizona is any indication – increased pay will result in more people wanting to be teachers again.